always been there for her. When she was in a pinch, and needed someone to pick up Jordan from school, we were there. Whenever she had a fashion question, a financial question about her 401k, insurance, or other things, we hooked her up. She's always thanked us profusely and told us she wanted to take us out for lunch or dinner. She's lived next door to us all her her life. We babysat for her when she was an infant. We took her to Chicago and to San Francisco with us. We've watched her grow up. The stars aligned this week so on Friday she asked us to meet her for lunch. Our calendars were flexible so we agreed. It was a delightful experience. We are both so proud of her because she is a single mom. She put herself through school while working full-time and caring for a child. 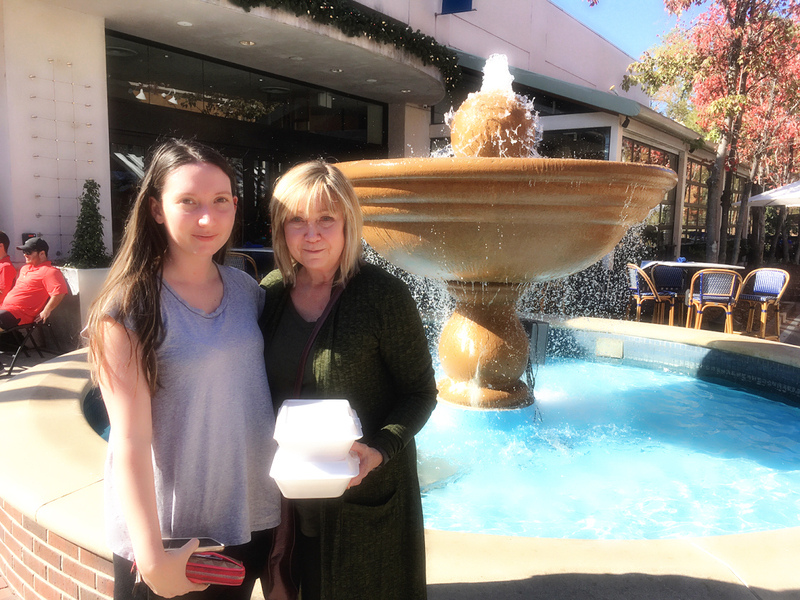 On the way out of the restaurant, I snapped a photo of Samantha and Jilda in front of a fountain on the sidewalk next to the eatery. In looking at the photograph, it's obvious to me that she has grown into a remarkable young woman. A truly heartwarming post. Thank you. What a touching post and very sweet. Love the photo. She should be proud of herself for working, finishing school while raising a child. It is so good to know that someone appreciates the little things. She does seem to be navigating through life well. I can understand you and Jilda being proud. She is blessed to have a caring aunt and uncle. She sounds like a wonderfully mature young lady. seems more like a daughter than a niece. She's done a wonderful job raising Jordan!! Beautiful lady and is blessed to have you two in her life to help her along the way. She seems very smart and responsible. Its hard to see them grow up, but makes ya so proud. You guys have touched a lot of lives. When you volunteer your services to someone with no strings attached, and they are appreciative, life is better for all. I enjoy reading of a responsible young person. She is blessed to have you both in her life, as much as you are to have her in your life.